Salads, entrees, platters - Asiago Cheese is the perfect complement to make your dish delectable. Pale yellow in color, firm in texture and slightly nutty in flavor. Asiago cheese goes great melted on top of French bread, on a side dish to accompany meats, a snack platter, or in a grilled panini. Asiago Cheese will be brighter and less yellow when fresh and often easier to slice. Aged Asiago Cheese typically is more yellow and pale in color with a firm, tough exterior texture. View Premium Italian Cheese Sell Sheet Here! Use this Mexican style cheese as a garnish, spice or to top off your main course. A few crumbles of Cotija cheese will go a long way. Chefs often use Cotija as a flavor enhancer for their innovation menu concepts. Its sharp fiery flavor is always noticeable. Cotija isn't just spicy, it also has a salty side. Great for soups, snacking, or however you may choose to use it. View Alejandro Cotija Cheese Sell Sheet Here! Straw in color, rich in flavor. Parmesan Cheese - The sweet & buttery flavor we all love melted on top of our meats, over pasta or with pizzas. This popular cheese comes dim yellow in color and hard/grainy in texture. Its light nutty flavor and buttery taste make this cheese perfect for anything. This white, "Italian Style Cheese" is served with a variety of meals - soups & veggies, omelets or frittatas. Like most "Italian Style cheeses", Romano cheese is very compatible in any dish. Pastas, spaghettis, even pan fried fish and meats, are great with the addition of Romano. This cheese grows sharper and smokier in flavor with time and it grates like aged Parmesan. Cheddar cheese is recognizable in most parts of the country by its distinctive yellow color. This color is a tasteless vegetable dye that is added to the milk. In the northeastern states, White Cheddar cheese is common. Cheddar Cheese flavor ranges from the younger "Mild" (7-60 day aging) through "Medium" (60-120 day aging), "Sharp" (6 months), to "Extra Sharp" (9 months or more). Gouda Cheese is a great choice for hot meals, nachos or even fondues because of its easy-to-melt body. Gouda grows firmer with age and sometimes is made with spices and peppers to enhance its light nutty features. Gouda Cheese is sold in different packaging; clear wax wrapping around the cheese typically means it's been aged and a more mild Gouda will often be in red wax wrapping. This cheese will make any recipe Gouda! Danish, Swedish, and Italian - 3 varieties of Fontina Cheese. Fontina Cheese is off-white to light yellow. Danish and Swedish Fontina Cheeses are less mild than the "Italian" variety, which is more buttery and smooth. Fontina Cheese is great for fondue, and goes well with light meats like veal or thin slices of prosciutto. Its smooth texture makes it great to mix with eggs and breakfast dishes. The famous 'Holey' cheese! Buttery, smooth, and holey. Swiss Cheese has a firm texture and mellow flavors that go great with portabella mushrooms, white wines and fruits. Swiss cheese is shiny white in color with holes all over the body. Swiss cheese is sold in multiple ways; pre-sliced and in wedges are the two most common forms. View Cheese Slices Sell Sheet Here! Cheese brings value to all menu concepts and product offerings. Our Cheese Crafters Cracker Cut Cheeses are perfect for slider sandwiches, party trays, meal kits...really, the list could go on and on. These cheeses are offered in the following varieties: Mild Cheddar, Monterey Jack and Mild White Cheddar. For dimensions, items codes and more information please view the Sell Sheet below. Usually eaten on crackers or bread, Edam is also a good accompaniment with wines and fruits such as pears and apples. Cream Cheese is strictly an American invention. It is uncured cheese which, contrary to its name, is made from whole milk, rather than cream. Cream cheese is light and spreadable, white in appearance and perfect for bagels, veggie platters, or baking. Cream cheese has a slightly tart flavor and works great with preserves & fresh fruit. Fresh Mozzarella can be used on pizzas and pastas. Fresh Mozzarella can also be used on salads and goes particularly well with fresh tomatoes, basil and Winona Pure EVOO for insalata caprese. Feta Cheese has a crumbly, moist texture that is pale white in color. Feta Cheese is great for Greek salads, pizzas, pastas or even with fruits on a dessert platter. Cheese makers sometimes flavor Feta Cheese with tomato and basil. Neufchatel Cheese is perfect for spreading on bagels or sandwiches. Neufchatel is similar to Cream Cheese in taste, but has a lower fat content. The texture of Neufchatel is slightly softer than Cream Cheese. Neufchatel goes well with fruits and fresh breads. This cheese is a great baking ingredient for breads, pies or cakes. This "Mexican Style Cheese" is crumbly, slightly salty, and firm in texture. Though this cheese is hard to melt, it makes a perfect addition for soups, tacos or with dark flavorful beers. Ricotta Cheese has a mild flavor with slightly sweet notes. Ricotta has a creamy texture, which is easily spread on breads. Often used to enhance casseroles, stuffing or dips. Blue/Bleu Cheese: Earthy, salty and crumbly. Sprinkle Bleu Cheese on your hamburgers, over shrimp, or enjoy with a dark beer. Bleu Cheese is often tangy in flavor, and has a very pungent smell. This cheese is a slightly salty, goes great with light meats, fresh fruits or soups and salads. Bleu Cheese is firm, but soft enough that it can be crumbled easily onto salads. Gorgonzola cheese is creamy and white in appearance and strong and tangy in flavor. Great with pasta, mashed potatoes, seafood, crumbled on top of a rib-eye, or with roast beef. A little bit of Gorgonzola goes a long way, both in flavor and aroma. The semi-soft Danish-originated cheese, Havarti, has a buttery aroma and smooth texture. Havarti has a pale yellow appearance with a creamy and slightly acidic flavor. This cheese pairs perfectly on chicken or roast beef sandwiches with a fruity wine like Riesling. View Havarti Dill Sell Sheet Here! Asadero is a mild, fresh and creamy Hispanic-style cheese. This cheese is perfect when melted and baked onto a Mexican-Inspired dish. This fresh cheese with a light flavor is the perfect addition to a meal with some kick. This Cheese is a Wisconsin classic. Firm sliceable exterior, chalky white in color, and a mild spicy smell. This cheese is perfect for grilled cheese sandwiches, melted on breads, burgers, soups, chicken, or used to spice up Mexican lasagna and enchiladas. This aged white Wisconsin Cheddar is complemented with horseradish and chives to create a unique cheese that works well on sandwiches, burgers, stuffed peppers, grilled cheese, and stuffed in meats. This product has a mild Blue Cheese flavor that is an excellent option for a Blue Cheese burger or a Buffalo chicken sandwich. Marble Blue can also be used to make a signature Panini with roast beef. Brie is a soft and creamy cheese names after the French region Brie, where it originated. This cheese is usually served slightly melted with fruits and nuts as a topping. It is also enjoyed served at room temperature with your favorite crackers and preserves. 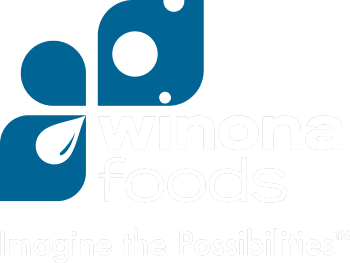 View Winona Reserve Specialty Cheese Sell Sheet Here!